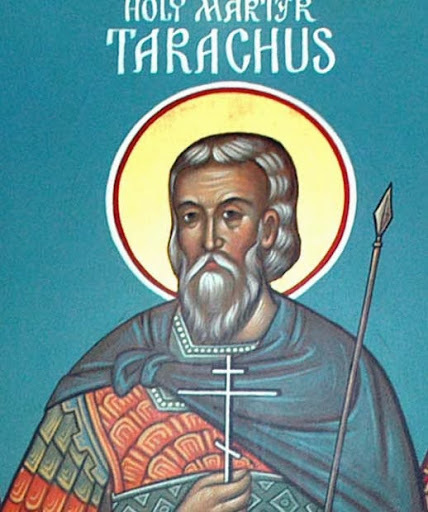 IN the year 304, Tarachus, Probus, and Andronicus, differing in age and nationality, but united in the bonds of faith, being denounced as Christians to Numerian, Governor of Cilicia, were arrested at Pompeiopolis, and conducted to Tharsis. They underwent a first examination in that town, after which their limbs were torn with iron hooks, and they were taken back to prison covered with wounds. Being afterwards led to Mopsuestia, they were submitted to a second examination, ending in a manner equally cruel as the first. They underwent a third examination at Anazarbis, followed by greater torments still. The governor, unable to shake their constancy, had them kept imprisoned that he might torture them further at the approaching games. They were borne to the amphitheatre, but the most ferocious animals, on being let loose on them, came crouching to their feet and licked their wounds. The judge, reproaching the jailers with connivance, ordered the martyrs to be despatched by the gladiators. Reflection.--Such is true Christian devotion. "Neither death nor life shall be able to separate us from the love that is in Christ Jesus."